The title really should be “Observations about Electric Fencing at Soil Born Farms“, but that’s really long. Maybe I should call it “The Longest Rambling Post I Have Ever Produced”. My apologies ahead of time for slow loading times. There are quite a few pictures. 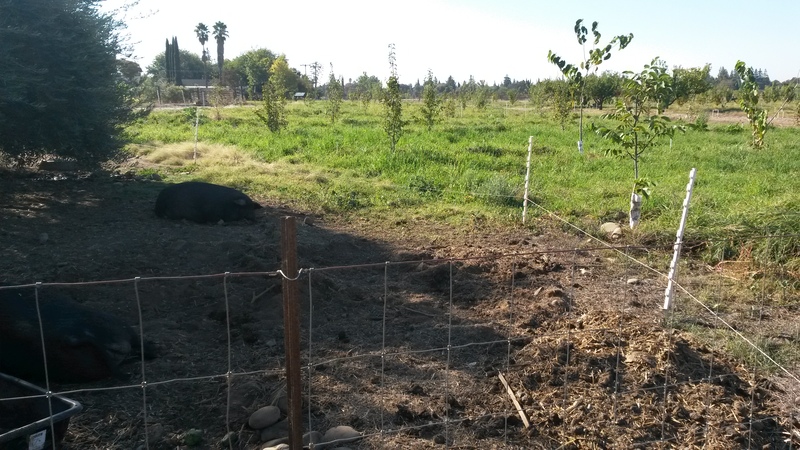 I’m going to talk about three electric fencing systems I observed at Soil Born. Remember Pork Chop? I met this Guinea Hog the first time I visited (link). I had been surprised by the electric fencing. I was a bit bashful about grabbing onto it in front of others, but I wanted to know how much juice was going through the poultry netting. 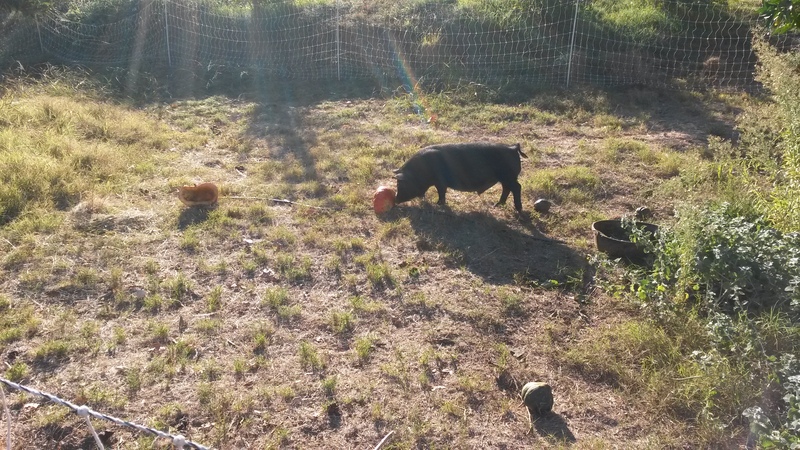 Pork Chop playfully pushes a pumpkin with his proboscis. The fence seems to be about 160 feet long. It’s touching the orange tree, it’s sagging everywhere, especially along the bottom of the netting. I’m not criticizing, just explaining the state of affairs. Obviously, Pork Chop isn’t getting out, so it works. Before I get to what happened, I need to point to another blog. (feel the tension building? What happened when I touched the fence?) The blog post I want to refer to is http://sugarmtnfarm.com/2012/04/19/fencing-2/ . Walter discusses testing electric fences. I want to borrow from his table of pain. 0.3 Kvolts (300 volts) is noticeable barefoot. Dry leather shoes will make it unnoticeable to just a tiny tingle. Rubber boots, even cheap ones, make it unnoticeable. In bare feet it is comparable to being bit by a horse fly. You pay attention, would probably rather avoid it but it isn’t that bad and if you want what is on the other side of the fence you’ll brave it. 1.0 Kvolts (1,000 volts) is noticeable wearing dry leather boots and fairly painful barefoot but possible to hold on. Compare it to being hit by a small rubber band on your cheek. You pay attention quick like and want to not have that happen again but would put up with it for $5 in cash per hit. Pick your personal price. 2.0 Kvolts is just noticeable in rubber boots, painful in dry leather boots and very painful if you’re barefoot. Compare it to being hit by a large rubber band on your cheek. You pay attention right well and really don’t want that done again! This is about the typical, actual, real world fence reading I get on our fences. Sometimes higher or lower. 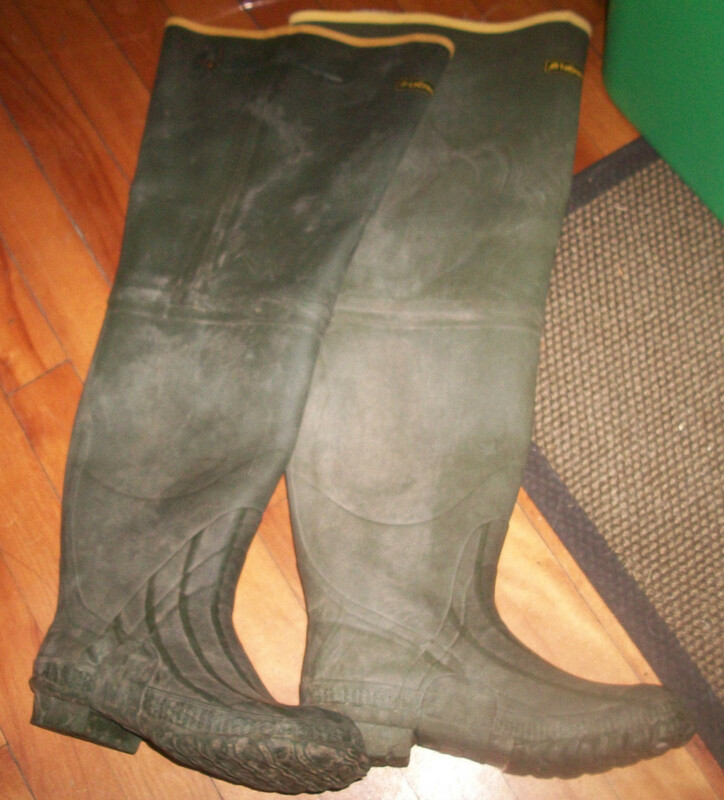 3.0 Kvolts is painful in my rubber dairy muck boots – obviously they’re not perfect insulators. I can hold onto the fence through multiple shocks if I must for some strange reason. I once did two shocks across the chest down to leather boots on wet soil when I fell on the fence. Another time I stood through six shocks from thigh to barefoot when I fell against a fence at this level – it took that long, six seconds, to untangle myself. Not advisable but doable. Definitely memorable. Compare it to being hit with a whip – you’ve had that experience right? Okay, for those who haven’t, it hurts a lot more than a big rubber band. You don’t want it repeated but in an emergency you could withstand it to save someone’s life including your own. 4.0 Kvolts is really hard to hold on even with most rubber boots, forget it with leather boots or barefoot. Standing on a rock with rubber boots makes this level tolerable if the rock is a little conductive, say it’s damp, or okay if the rock is dry and non-ferrous of course. This is like a wasp sting – the big kind. You’ll feel it for a while afterwards and avoid that fence. It’s a big neon STOP sign. 6.0 Kvolts and above is very hard to hold onto with rubber boots unless they are perfect insulators (rare). Stand on a rock and it still may hurt badly with conductive rocks. If you were wearing leather boots, rubber boots with holes or barefoot then you’ll be feeling that spark for five or ten minutes after and you’ll remember it clearly for days. 9.7 Kvolts is the worse spark I’ve gotten – very, very memorable. I touched the unloaded fence switch on the charger side. It was like being hit with a big wasp sting and a well swung 2×4 at the same time. I checked my hand for burns – there was a small one on my thumb about a millimeter in diameter where the shock went in. Dumb mistake. I have not repeated it. So, I look around to make sure no one is looking as I reach toward the fence. 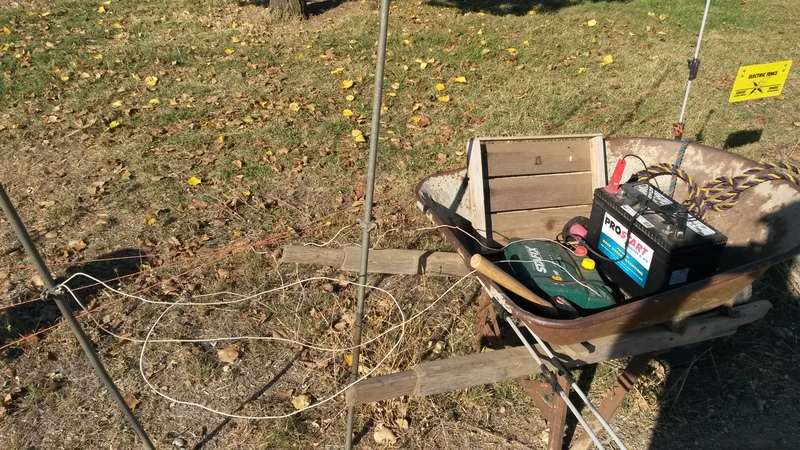 There are a few precautions to take before you attempt to gauge an unfamiliar electric fence. Make sure that your tongue is well away from your teeth in case you bite down from the pain. Don’t lean forward–you want to fall away from the fence if you lose your balance. Don’t grab the fence, touch it with the back of your hand. Electric shock can lock your muscles. It’s a bad thing if the muscles in your hand lock closed on the fence. 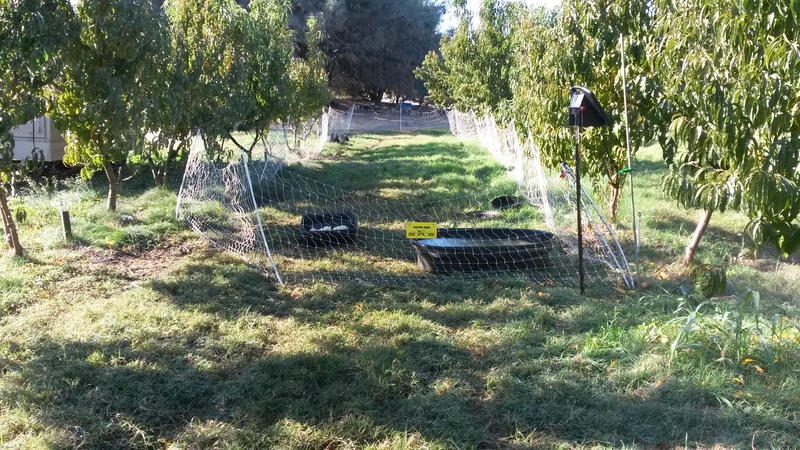 OK, the above list is overkill for poultry netting, but once shocked twice shy. Some of you are shaking your heads. Bumping an electric fence isn’t a big deal you say. So, let me regal you with a tale from my youth before I talk about touching the poultry netting that keeps Pork Chop (PC from now on) confined. My job was to shut off the water, move the line of pipes to the next valve and turn the water back on. I did this with a friend of mine. We did this in alfalfa and barley fields as well as pasture for the dairy cows. We did this twice a day, morning and evening. 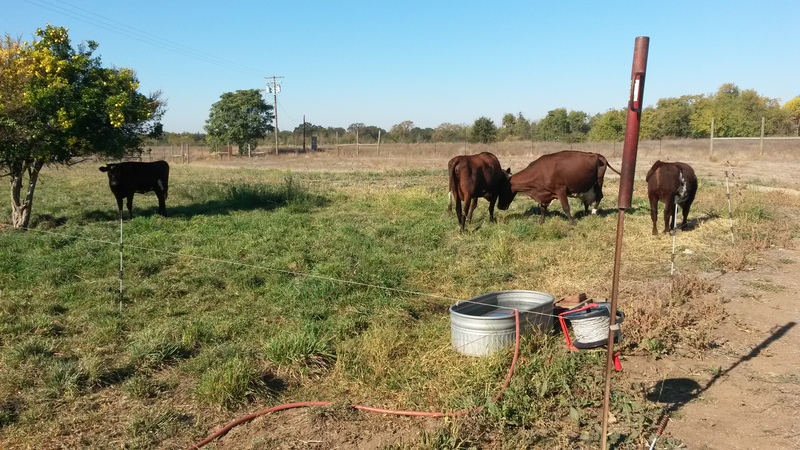 The pasture was surrounded by electric fence. One cold morning finds me moving pipe in the pasture. Technically it was morning, but it was pitch black. 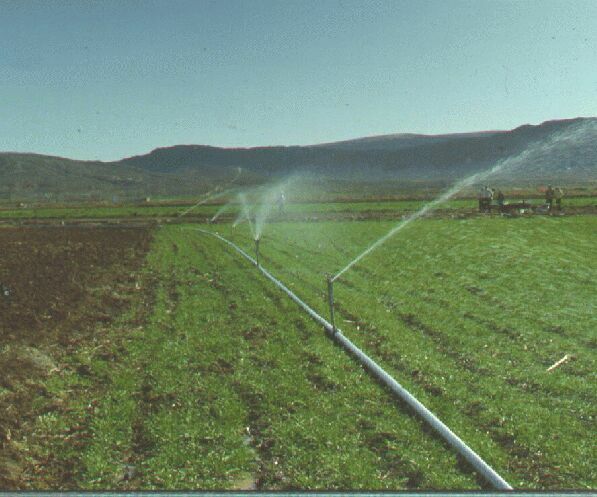 I was galumphing around in my irrigation boots, moving the line. So, the air is cold, the pasture is cold and I’m soaked from the waist down. This leads to the inevitable–I have to pee. In the country, it’s okay to pee outside. It’s one of man’s inalienable rights. I didn’t have any problem with this. The problem was that the farmer had lots of kids and some of them were daughters. Cute ones. One was in my grade. I wanted to make sure no one saw me. Walter, if you’re reading this blog, you know where it’s going. That’s a pun. Deliberate. I sidled up to some taller grass and began my business. Remember, I’m soaking wet. I might be wearing rubber boots, but I’m covered in water. My boots are covered in water. I’m conductive. And my stream hit the fence I didn’t see. Life changer. People thought I got a perm that summer. Well maybe I did (see cute daughters above), but I always had a curl in my hair (until most of it disappeared) after that. It was a defining moment for me. I had experienced the most painful moment of my life to that point, and it was to a certain place. I’m a 7th grade boy. Things could have tipped either way, I could have cried and called it a day. But I didn’t. I manned up and continued to work, with a grimace on my face that has never really gone away. So maybe you can understand why I’m careful around electric fencing. That’s right, I’m actually back on subject. So, I reached out to Pork Chop’s fencing and pressed the back of my hand against it and waited for the Zzzt after the Pause. Nothing. Zero. Zip. Bupkis. Nada. I put the back of my hand on the hot clamp. Nothing. Maybe there was an issue with the ground rod or maybe the fence was grounding out. But there wasn’t any juice. I went to visit Pork Chop’s relations after this. 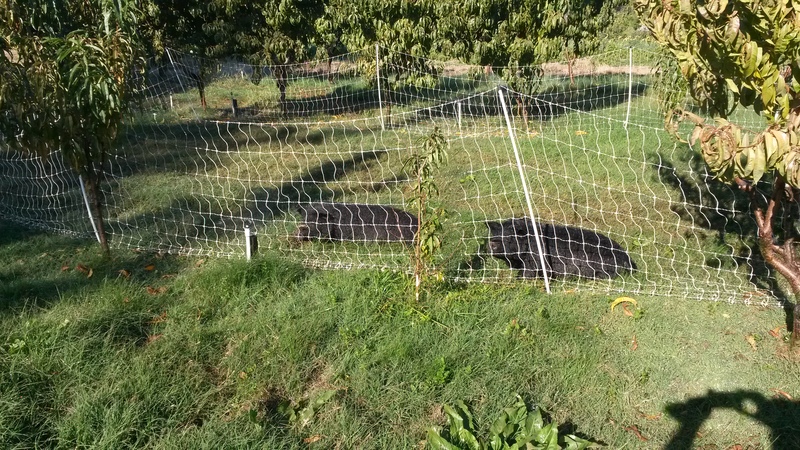 There are two pigs at the far end of this pen. The sprinklers are running. On me. On the fence. On the pigs. It’s a lot of water too. I didn’t bother to check for juice. See the white pipe coming out of the ground by the fence? It’s a sprinker and it’s running. PC’s sisters (I didn’t ask their names) had a choice between sprinkler with shade or sprinkler with sun. They chose sun. I moved on. Truthfully, I was kind of cranky. The pigs didn’t seem to mind, but they should be able to get out of the water. I went to see PC’s parents next. 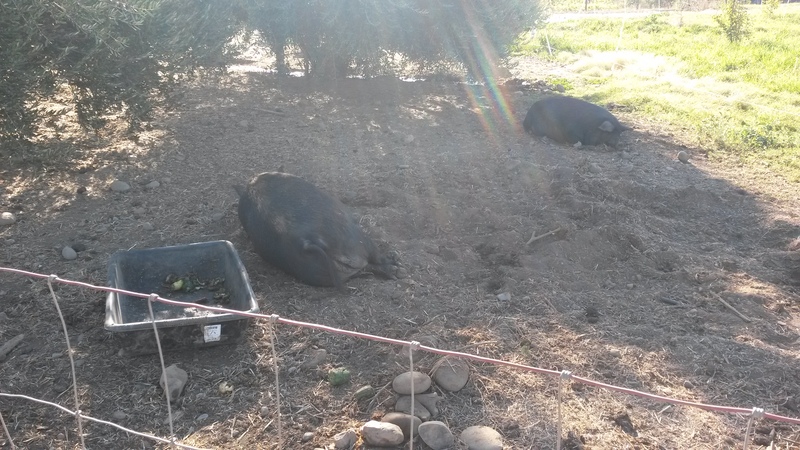 These two were held in by non-electric fencing on two sides. The third side was a strand of electric fence about 8 inches off the ground. see below. The electric was out of reach, so I didn’t test it. I could see more fencing in the distance. It looked like two cows with their calves. It’s hard to see here, but there are 3 strands of polywire. They are hot. I bumped the wire and felt a tingle. This is a pop of about 1 on Walter’s scale. Below, you can see white polywire. This was used to create small paddock. It’s laying on the top hot wire. You can draw your own conclusions. I don’t know if there are issues with critters getting out, but I would want more pop than I found with these fences. 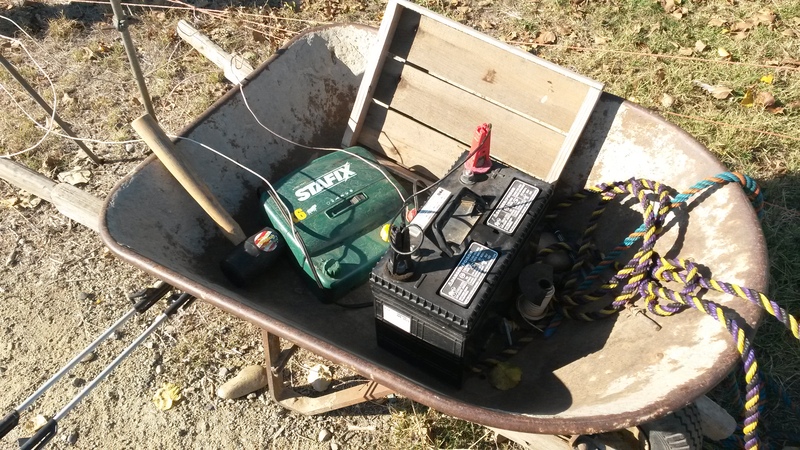 This entry was posted in Tools and Equipment and tagged cow, electric fencing, fence, pig by admin. Bookmark the permalink. Matt, I think electricity is nature’s way of letting me know I’m not as smart as I think I am.